Apple hasn't been one to adopt futuristic tech trends so quickly, letting the mass market decide when the time is right. Samsung's Galaxy S6 edge started the beginning of a whole new chapter in smartphone history, and the Galaxy S7 edge has proven even more popular -- with sales reaching at least 25 million by the end of the year (this total doesn't factor in the number of regular Galaxy S7 units, or the units of the upcoming Galaxy Note 7, that will reap sales for the Korean giant). When it comes to smartwatches, however, Samsung has employed a curved AMOLED display in the now near two-year-old Gear S, but the smartwatch didn't take off with consumers - though the edge is winning consumer dollars in the smartphone department. Samsung's new Gear Fit2, though, is giving Apple some reason to rethink the usual box form for smartphones and smartwatches (despite Cupertino's towering smartwatch sales): even as we hear that Apple plans to utilize flexible OLED displays for the iPhone 8 and iPhone 8 Plus in 2017, we're now seeing that future Apple Watch models may employ a curved wearable display. Apple has been granted a patent with the US Patent and Trademark Office (USPTO) on June 9th (the patent was filed on December 8, 2014) that is titled "Wearable Display," calling for a device that will consist of a silicon substrate that's only 50mm or less in thickness, with an array of LEDs that have a pixel density of 40PPI (pixels per inch) or greater. The patent drawings provide further details. LEDs in wearable displays would provide indoor and outdoor brightness that would prove easier on the eyes due to the inherent brightness of OLED displays, but OLED displays also provide better battery life -- as OLED displays are "light-emitting" and display their own light without requiring a backlight. The current Apple Watch has an OLED display but its small battery size means that users can only get 18 hours max (5 hours of on-screen time) out of the device, which pales in comparison to the 2-3-day average battery life of Samsung's Gear S2. The flexible OLED display found on the Gear S provided up to 4 days of battery life, and the Gear S2 can as well, though under certain conditions. We don't know how Apple will make use of such a Wearable Display patent, but it appears as though the pixel density may be too small for an Apple Watch. Apple may decide to create a special fitness band for athletes, since it will need a pixel density far greater than 40ppi to create a likeable display for consumers. Most smartwatches, even the Gear Fit2, have a greater pixel density than 40ppi (most require at least 200ppi). 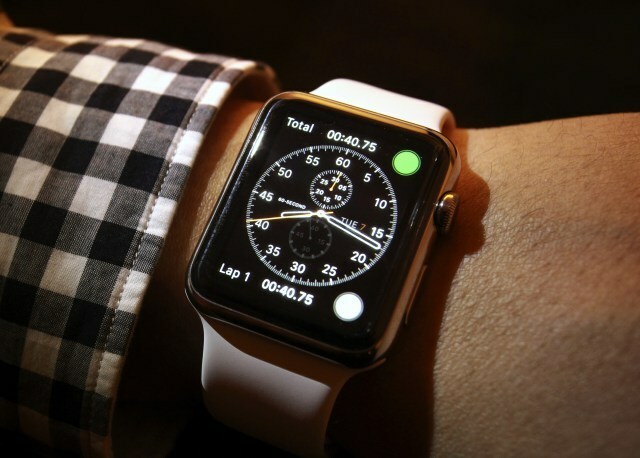 At any rate, Apple is preparing to experiment with flexible displays on its wrist wearables. This may never see the light of day, but with the rise in popularity of flexible OLED displays, it's hard not to see the possibility that this patent may just creep up again in the near future.